Guadalupe Social Services, Catholic Charities, Diocese of Venice, generously provided Thanksgiving food bags for families in need at Timber Ridge at Sanders Pines, Eden Gardens, and Main Street Village. Guadalupe has been helping residents around the holidays for more than 10 years and continued their assistance this year. 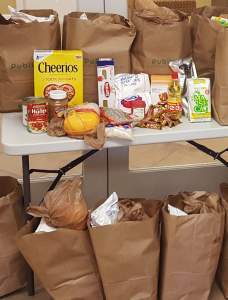 The bags contained some of the traditional items for Thanksgiving but also included other foods such as pasta, beans, and masa for tortillas. Many of the families who benefited from Guadalupe’s generosity work in agriculture and greatly appreciate the extra food at the holidays. Guadalupe Social Services distributed more than 650 holiday food bags throughout Immokalee this Thanksgiving. They will continue their tradition of helping residents at Christmas and Easter. Timber Ridge at Sanders Pines, Eden Gardens, and Main Street Village are affordable housing complexes operated by Rural Neighborhoods in Immokalee. Timber Ridge was recently acquired by Rural Neighborhoods in the Eden Park neighborhood. Renovations of the units are scheduled to start next month.